Friday evening ended up being a little backwards. Or something. Scott mowed the yard right after he got home which delayed our big plans until later. Okay, we didn't really have big plans but we (and by we, I mainly mean me) wanted to check out a new to us local restaurant that I'd read about in an article on Wastebook. We like to try new places (sometimes) and we definitely like to support independent mom and pop type places (although we certainly support the big dog chain restaurants too). 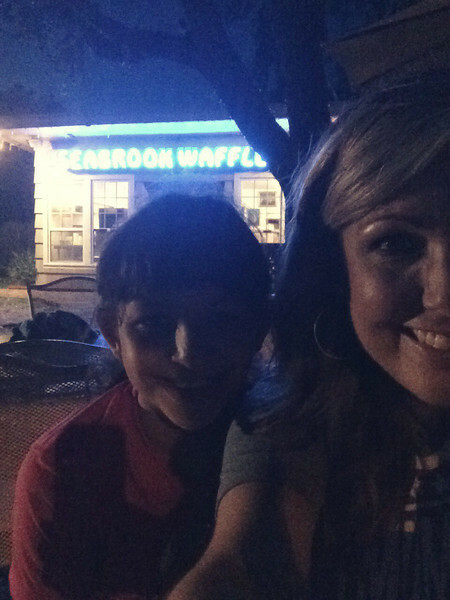 Several from the list are already among our favorite places but we hadn't heard about Seabrook Waffle Company. So that was on the agenda for Friday night. Except we found ourselves facing a slight dilemma, do we eat supper before and risk being too stuffed for dessert waffles or do we eat waffles first? We played it fast and loose and went for waffles first. After talking with the girls manning the place (note that clever play on words there) we decided to try their savory waffles, since we hadn't had supper, each ordering something different so we could sample. I got a Monte Cristo waffle which had ham, swiss cheese, raspberry preserves and bacon, Scott ordered their Blue Pelican which had bacon, peach preserves and gorgonzola and Annelise ordered a waffle with egg and bacon. The first few bites of our respective choices were quite tasty, the savory flavors melding nicely with the sweetness of the waffle. Halfway in though we each hit the sweetness overload, what had once been delightful was now making us want to hurl, all of those flavors and all of that sugar was just too much. Don't get me wrong, their waffles are very good, however I could not imagine eating one by myself. We'll probably go there again sometime but when we do we will definitely all three share one dessert style waffle. Now here's the funny thing, as Scott was eating his waffle, and rapidly remembering that he does not like gorgonzola cheese, he kept staring at the Dairy Queen (the waffle place is located right behind a DQ and we were sitting outside) and started talking about how much he wished he was eating a chili dog instead of that waffle (he was well past his halfway point and on sugar overload). Once we threw our trash away and headed for our car he announced he really wanted DQ, Annelise declared that she did too. We decided not to go to that DQ in case the girls at the waffle place saw us, we didn't want to hurt their feelings, but we did stop at another one and headed home with two chili dogs and one frito pie (I am a sucker for frito pie, and it sounded like the perfect anecdote for sugar rush). We settled in with our DQ goodies in front of the tv to watch My Big Family Renovation on HGTV (it premiered the night before but too late for us to watch it then--10:00--gasp!). I adore Jen Hatmaker and am excited to watch her family remodel their 100 year old farm house. I also like the fact that this is a tv show we can all three enjoy together! We assembled blessing bags at Mugs & Muffins (a monthly breakfast and devotional for the ladies at church) Saturday morning. 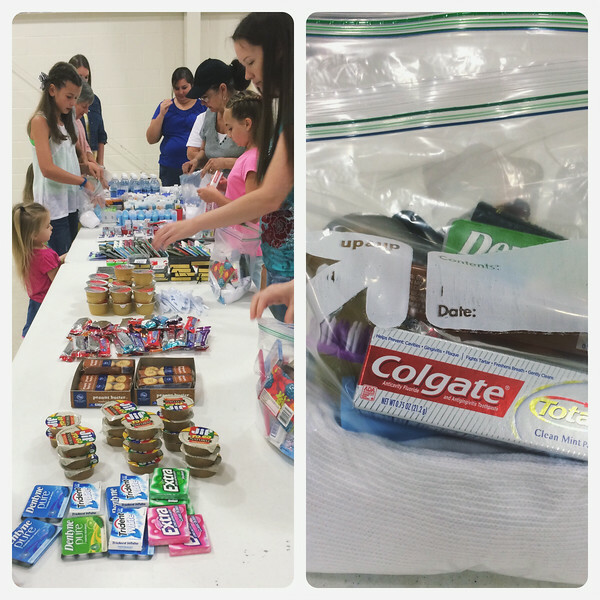 Everyone brought either a personal hygiene type item, individually packaged non-perishable food, bottles of water, socks and small bibles then we just filled them in an assembly line fashion. Now I have two bags ready to share with someone in need, easy peasy! This was my view for a short while yesterday after church and lunch. And yes, I may have guilted them into reading before they killed zombies on a video game (Scott) or burned up braincells in Minecraft (Annelise). Scott started reading A Prayer for Owen Meany on our cruise back in February, he made quite a lot of progress (!!) 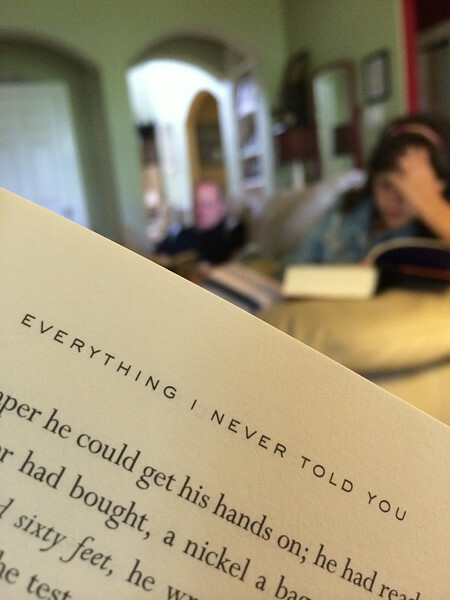 but ever since then it's been a like a brutal chore for him to read, even though he likes the story. I don't understand. Annelise finished reading Hatchet and I ordered sweetly asked her to pick another one to start reading and she came be-bopping downstairs with Harry Potter and the Goblet of Fire. Now, I am ALL for her reading Harry Potter (she's read the first three) but it is quite a commitment and I worry she'll lose interest and feel like she might never finish (books 4-7 are huge). We'll see, fingers crossed. I love your DQ story! I would so do the same thing! DQ's are few and far between here, but when I do find one I have to get a strawberry blizzard!